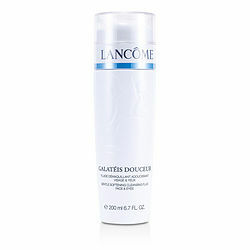 “Galatia’s Douceur gentle softening cleansing fluid” - perfect for my skin (dry skin). I use every day for a few years by now. In the morning and bed time. My face looks and feel smooth and silky. I never used lancome products until now ( I became mature age) and regret I didn’t. My face fresh and younger looking even in the morning when I wake up. This fluid is a “gem”.